Kerger was founded as a family business in 1919 by 25 year old Jan Kerger. His father, Kees Kerger provided the investment capital to facilitate the start of Kerger & Co N.V. Marine Electrical Engineers. At the time, the company employed 12 people, most of whom were technicians and was located at the West Zeedijk in Rotterdam. In 1950 Mr Kaptein Sr. was hired out of 40 applicants as an administrative assistant. Jan Kerger and Leendert Kaptein shared a military background and got on well from the start. During 50s, Kerger was formed by the managing director, a female accounting employee and 15 technicians. The company focused on the installation and repairment of electrotechnical parts in the shipping industry. Many of the American Liberty and Victory ships built in 1942 had suffered damage. The Netherlands, particularly Rotterdam’s harbor, were heavily bombed by the Germans during WWII. Therefore there was a substantial demand for marine electrotechnical parts, as well as technicians who were familiar with the products and the ships that needed them. After the reconstruction of critical parts of Rotterdam’s harbor, most marine suppliers were situated in the “Zeemansbuurt”, (seaman’s area) in the vicinity of the West Zeedijk. Customers were mainly from Rotterdam, Amsterdam and Dordrecht. In a competitive market, Kerger supplied a wide range of products. Most competing companies had a considerably larger staff than Kerger did. Kerger only employed 20 people, some of the other companies over 120. On the other hand, being smaller. Kerger had the upper hand in being flexible. Furthermore, the company distinguished itself by building strong customer relations, an aspect which would develop into a genuine Kerger trademark. Kerger imported many marine electrotechnical parts such as plugs, cables, power strips, lighting and lanterns. Over the years, the company had built a strong reputation in supplying high end lighting and lanterns used on ships. Most ships carried a crew of over 40 men, each of them requiring a reading light. You can imagine reading lights were a popular item in the Kerger catalog! At times, it was challenging to get electrotechnical parts transported onto ships that were anchored outside the port. 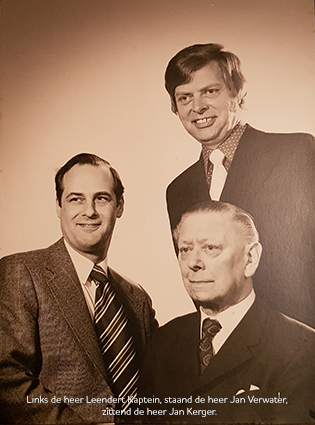 Both Mr Kaptein Sr. and Evert Kaptein have their own memories of how they creatively improvised in order to get essential marine parts on board their clients’ ships. On several occasions, Mr Kaptein Sr. delivered the requested parts by dinghy, after which he had to climb a 15 meters high rope ladder onto the ship. Evert Kaptein remembers the times when parts were flown onto ships or drilling platforms by helicopter. Naturally, daily operations, technology and means of transportation have changed enormously over the last century. 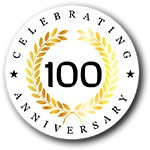 But Kerger’s business mission of going the extra mile to facilitate the client is as distinctive now as it was one hundred years ago. During the 1960s, Kerger’s range of products was not yet as extensive as it is today. Acknowledging Kerger’s logistical advantage, strong network and favorable location near the harbor, Mr Kaptein Sr. set his goals on offering a wider range of products. The company fortified its alliances with Madsen and adapted its purchase policy accordingly. Products could now be offered from stock, which made Kerger a wholesaler as well. The new business strategy gave way for significantly larger clients, who could count on Kerger day and night. When the accounting employee resigned to get married (in those days quite a common reason for a woman not to pursue their careers), Mr Kaptein took it upon himself to get familiar with all the ins and outs of the firm’s accounting. Administrative processes were not automated let alone digitalized yet in those days. Typewriters and carbon paper were utilized to draw up official documents, such as invoices. Mr Kaptein Sr. visited clients for the payment of invoices and handed out receipts for services rendered and products delivered. Many payments were in cash, unimaginable nowadays! The money was brought to the bank in person by Mr Kaptein. Having familiarized himself in detail with the company’s financial situation, Mr Kaptein noticed that the company had a substantial bank account. It was decided the money could be invested in the company. This had a positive effect on Kerger’s market position and growth opportunities. In 1959, Mr Kapitein was promoted to director, giving him full power of decision. The company was growing steadily. Since Mr Kerger did not have any children, he appointed Leendert Kaptein and Jan Verwater as his successors upon retirement. This decision allowed the company to continue with their business development. Following the market’s developments, Kerger shifted its focus accordingly. In the early days, the company concentrated on assembly and construction work. However, as the company developed and grew, the technicians’ workshop was no longer sufficient. The company moved and the decision was made to concentrate on sale and whole sale. And after some years, due to continuing expansion, the company moved again. The customer base had a more international character now. In 1980 Kerger opened a branch office in Houston, Texas.